There were a number of occasions when the Samsung NXIOOO very nearly passed off as the Galaxy Camera. You could blame that on the dental white exterior and similar design. The NXIOOO is also pegged as a smart camera but does not tout an AMOLED touchscreen or the Android OS. 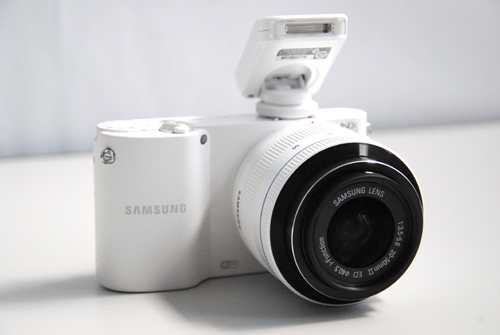 This is a compact system camera (CSC) that also offers Wi-Fi. and the ability to link quickly with other compatible Samsung devices. We did not expect much from this CSC. it doesn't look or feel like a serious shooter. A couple of shots later the NXIOOO made us rethink our presumption. It is fairly easy to use, nowhere near the learning curve one encounters with the Olympus PEN cams The accompanied 20-mm lens is modest at best but the results were pretty good. Colors appeared natural with a pretty good depth of field. Details captured quite well though at times they appeared little soft. The camera fared really well in low light up to ISO 1600. Unfortunately, neither the lens or the body incorporates optical image stabilization Unless you add a lens with built-in OIS. Sharing images via email, to Flickr, Picasa or PhotoBucket was simple over Wi-Fi but we had difficulty making it latch on to a hidden network T -camera also includes a microHDMI port. The Samsung NXlOOO's interface is not intimidating, performs quite well and is available er. a very competitive price.